This month’s Firelight Interview is with author Julie Paul. 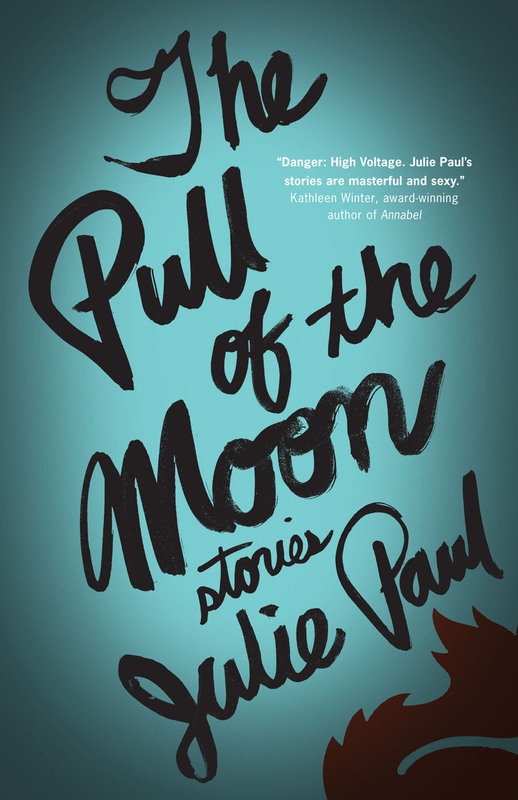 Her second collection of short stories, The Pull of the Moon, was chosen by the Globe and Mail as one of the best 100 books of 2014. “This is writing of emotional veracity with an edge, of humour alongside gravity, of darkness tempered with blithe optimism,” wrote Rover Arts, and I have to agree! My geographical / blood home is the rocky, tree and lake-filled land of the Lanark Highlands in Ontario, where I was born and raised. My current home now is on the west coast, and it’s a place I have left six times with the intention of living elsewhere: I consider myself a bit of a nomad at heart. But here we are again and, I have to say, I’m more comfortable and content here than ever. It could also be that my family has put their foot down and won’t leave—at least not for a few more years. You don’t include MFA — or even BFA — in your bio. Why is this? As far as writing goes, I did things a different way. 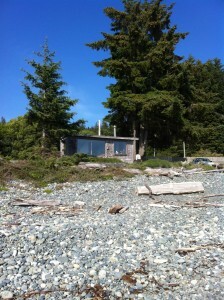 When I was fresh out of high school, I came west to go to UVic for creative writing. Long story short (or here’s another version): I left after one year to attend massage therapy school back in Ontario, which was, in retrospect, the best decision of my working life. Learning to write is a lifetime’s work, and that can take many shapes. For me, thus far, it’s been reading, mentorships, short courses and writing groups. 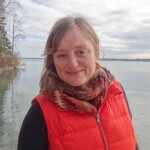 I’ve worked with Elisabeth Harvor through Humber School for Writers, and Annabel Lyon via Wired Writing Studio at Banff. Both of them helped my first book, The Jealousy Bone, see the light of day in 2008. And way back, I took some Continuing Education courses with Madeline Sonik that were instrumental in giving me back my confidence after not writing much for a few years. I have nothing against writing degrees. What an amazing thing, to have time and focus to write! Along with instruction on craft, degrees in writing are good at providing—from what I can see from the outside—deadlines, reading lists and community. I’ve become good at using made-up deadlines or ones for magazine submissions to spur me on. I try to keep my reading list open and varied. And I am fortunate to have the writing community that I do—locally, Victoria is a rich city for all creatives. You know, I was so bold as to say that recently, and as soon as I did, I got blocked up. Pride cometh before a fall and all of that. Mostly, what I get is word-tired, when I’ve been writing for a long stretch. Then, I need to do something else entirely, to get myself back into it. Usually that’s getting outside, walking or swimming, or baking cookies. What is your ideal writing retreat, and has this changed over the years? The first time I really retreated to write was at the Banff Centre for the Arts, for the two week on-site portion of the Wired Writing programme. I loved it—for the first week. Then I was ready to come back to my family—my daughter was only six at the time. I think it also had something to do with the landscape: although most people adore being in the mountains, I felt slightly claustrophobic. I think I do better with wider vistas. I took myself on a one-month retreat to a village in Mexico two years ago, and while I loved writing in my little casita beside orange trees and great-tailed grackles, what I realized is that I get inspired by language—the ones I speak more than the ones I don’t. I overhear snippets of conversation, I observe dynamics, I talk to people… all of these things feed my creative process more than I knew. The month away was amazing in many ways, and what a privilege it was to have made that opportunity happen (thank you, family! ), but it made me rethink my ideal situation. 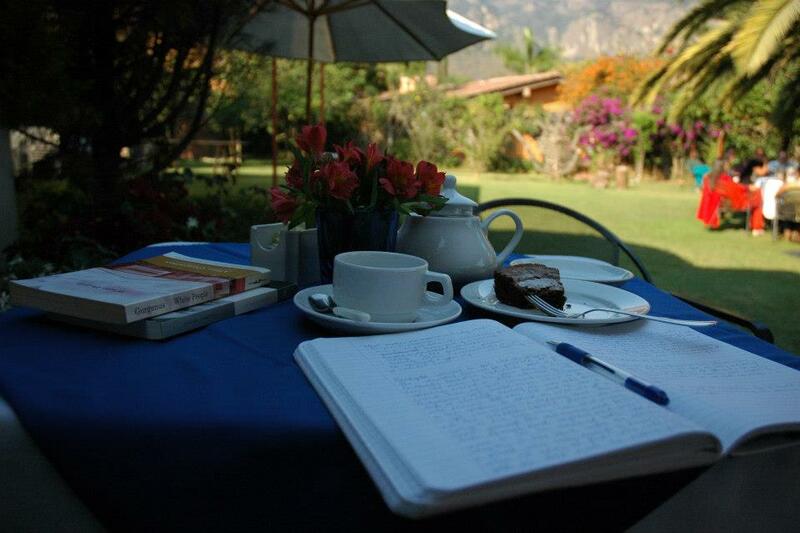 I often ended up in the bookstore/café, reading and writing on the gorgeous patio. Now, my ideal retreat varies according to what I want to accomplish. For instance, I’ve just returned from a cabin on the ocean for three nights, where I had two tasks in mind: to dive into a novel rewrite, and to further organize my first poetry manuscript. There’s no wifi or cell service out there, and few distractions, so it is a perfect place to buckle down. I’ve done this three times at the same cabin, and it seems to work well for me. Ocean retreat: no Wi-fi, no cell service. I’ve also gone away for a few days at a time with writing friends, and we write all day, then have a little reading (and a little wine) in the evenings. It all works; even on my writing days at home, I often take my notebook to a coffee shop to shake things up. You say you play tennis: does this impact your writing life in any way? I took up tennis about five years ago, when I saw how much fun my husband was having while I watched from the sidelines. Now we play about three times a week, all year round (mostly outside—it’s amazing what you can do with a giant squeegee). Tennis is a fantastic way to get me out of my head, so that can impact my writing life in a good way, when I’m stuck or just done with words. But what playing tennis with my hubby has also done is reflect the reality of the writing submission game: in other words, I rarely win. In fact, wow, I actually just checked my email and bam! A rejection. I’m becoming a good loser, and also, hopefully, slowly improving my game. Is there an interplay between your work as a massage therapist and your work as a writer? I have tried to keep these worlds quite separate in my life; I don’t want my patients thinking that I’ll write about things they might say to me while in treatment! However, in the novel I’m revising, my narrator’s in a scene that includes a massage therapist, so I guess it’s time I wrote about a world I know very well. Right now, I work three days a week as an RMT, which means I’ve got two weekdays in a row that are dedicated to writing. That’s pretty sweet. And I do believe that having a job that is not desk-based has helped my writing, mainly because I’m not overwhelmed by screen time or sitting too much. I also help people in a tangible, often immediate way and get paid for it; I don’t need to put pressure on my creative life to bring in the bacon. Although, of course, getting paid for our writing is always a beautiful thing, and I welcome this with open arms! My favourite story in The Pull of the Moon is Her Full Name is Beatrice, written in second person, while all the others in the collection are in first or third. Can you talk a bit about your process of writing this story, including your choice of perspective? I’m so glad you enjoyed that story. It’s the oldest story in the book; I wrote a first draft way back in 2006, and wrestled with it for years. It’s a story about a tough subject—a woman who kills her own child—and it’s all fiction, but a woman in a nearby town did this when my daughter was the same age as her child. This affected me deeply for a long time. What made me turn to the second person POV—a POV I greatly enjoy in small doses—was that I felt that I needed to both make it intimate for the reader and also more of a presentation of “facts.” For a long time the narrator came across as judgmental, and that wasn’t working for me: I wanted the reader to come to her own conclusions. The perspective I chose to write it in allowed me to be a bit more experimental than a traditional narrative; I included lists, subtitles, and shifts in focus. I hope this worked to give a bit of white space—and therefore a little break for the reader, too—in a dark story. I noticed that you gave a shout-out to your writing group in the acknowledgements in The Pull of the Moon. How do you think writing groups can help (or hinder) a writer’s work? I think writing groups are marvellous, with the caveat that the people in said groups must be a good fit for the general culture and vibe of it. This is no small feat, finding a good balance, and it often comes via trial and error. There is no room for nastiness or competition. For me, it’s all about support and camaraderie, and helping the work become its best self. What has recently turned your crank as an artist (sentence, phrase, novel, short story, play, painting, philosophical question, deep understanding about art-making)? Why do you find it so exciting? What’s made me excited this week is re-listening to Billie Holiday’s 1957 CBS’s The Sound of Jazz recording of “Fine and Mellow” as research for my novel in progress. There is so much heartache and history coming through in her voice that it makes me very emotional, especially knowing that she died the following year. Not to mention the absolutely brilliant performances of all of the musicians on stage that day. Wow. What a gift this recording is to jazz lovers. What a gift she was to the music world. 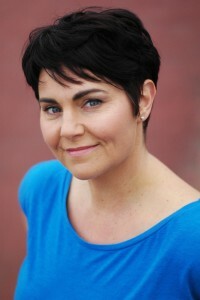 Next month: Andrea Thompson, spoken word artist and author, who has recently launched her first novel, Over Our Heads. Thanks Lauren – your interview has whet my appetite for this author. Great! The Pull of the Moon is an exceptional collection: varied stories, lots of different perspectives.